As mentioned, today is second installment in our Top 9 of ’09 series, looking back at the top sports stories of 2009, as covered here on the Science of Sport. Yesterday we covered stories 7 through 9, looking at sudden death during marathons, Meb Keflezighi’s win in New York and the Tour de France and doping. Stories 4 through 6 produce a mix of controversial, heated and awe-inspiring. Usain Bolt began 2009 with greater expectations than any sprinter in recent history. A Beijing Olympic games that produced three golds in three world records catapulted the young Jamaican into the sporting stratosphere, making him an instant celebrity. Track and field rarely delivers athletes who transcend the sport and become sporting icons, but Bolt was one such athlete. Throughout the off-season, his activities were documented, his parties reported, and his car accidents covered as front page news! Then the season began, and astonishingly, it proved even better than the one before. Berlin, a return to the stadium where another sprint icon, Jesse Owens, had rewritten record books 73 years before, produced two of the greatest sprint performances ever. The table below (click to enlarge) shows the 20 m interval times achieved by Bolt, Tyson Gay (second in 9.71s) and Asafa Powell (third in 9.84s), courtesy the IAAF analysis of the race. To me, the stand-out feature of the analysis is that out of 16 races (semi-finals and finals), the fastest first 20m interval belonged to Usain Bolt, one two occasions (2.89s). Bolt was in first place at 20m, which is amazing considering his size – the tallest sprinter in recent years, and a man who should not be able to start as fast as he does. Of course, once he’s into his running, he’s absolutely unstoppable, thanks to an extra-ordinary stride and what I believe is unparalleled neuromuscular co-ordination and stretch-shortening cycle activity. As the graph below shows, he extended his lead as the race progressed, running his fastest 20m interval between 60 and 80m. Gay and Powell fought bravely, but the graph reveals how the gap just got larger and larger. 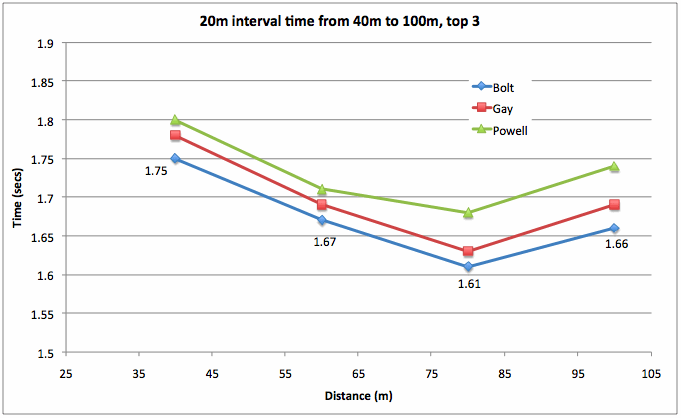 Interestingly, his final 20m showed a slowing in speed, which is typical of 100m races – nobody speeds up from 80m to 100m. This is exactly why predictions of what Bolt would have run had he not celebrated early in Beijing were misplaced – they assumed constant speed to the line, and Berlin clearly showed that this does not happen. Regardless, Bolt again moved the 100m event forward a generation. How much faster can he go? Scientists have predicted that the limit exists at 9.48s, which is now “only” 0.1s faster than he has gone. Tyson Gay cannot be discounted either. 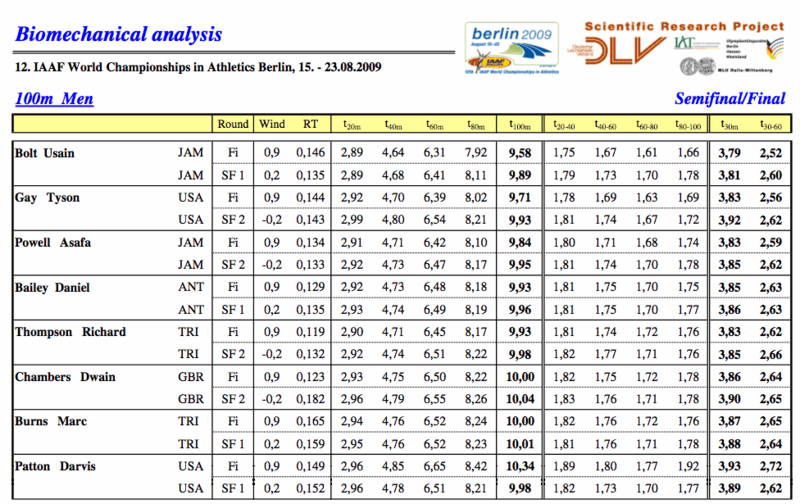 9.71s in Berlin, followed by a 9.69s in Shanghai. Whether 2010 produces the same astonishing performances (no Olympic or World championships to drive performance, remember), one thing is certain, 100m sprinting is in an exciting place right now. Then of course, there is Bolt’s 200m. Not nearly as competitive, for here, Bolt is all on his own, way clear of the rest of the world. Michael Johnson’s world record of 19.32s from Atlanta in 1996 was supposed to stand for generations. Bolt has now reduced it to 19.19s. And scariest of all, he has the potential to run it considerably faster. If you take Bolt’s reaction time from Beijing (which was very slow at 0.182s) and compare it to the reaction time from Berlin (0.131s), you find that his actual running time in Berlin was about 0.06s SLOWER than in Beijing. This suggests that he can lower the record to at least 19.14s, if he links his reaction time to faster running time from Beijing. Is sub-19s possible? I’d say no, because it would require a reduction of another 0.20s, which is huge considering that he has already knocked 0.11s off his Beijing performance. If he runs 18.99s, it means the world record will have been improved by 0.33s in a few years. Stranger things have happened, but I can’t see it, as amazing as Bolt is. And then there is the 400m event. It seems inevitable (barring injury or a loss of form) that Bolt will one day step up to 400m. When he does, 43.18 will be threatened, and perhaps even the 43 second barrier will fall. Will this involve a change in training that negatively affects his 100m and 200m performance? I’d suggest that it must, and so if Bolt does step up, he may find that his 100m and 200m times “stagnate”, but his 400m times move that event forward, just as he has done for the 100m and 200m. Time will tell…for now, let’s hope that Bolt continues for a decade, because he’s been great for the sport of athletics. This quote was attributed to Eric Ravussin, a diabetes and metabolism research from Louisiana State University. It formed the backbone of a piece published in Time magazine in August which basically said that those of you who exercise to aid with weight loss are wasting your time. For obvious reasons, given that millions have used exercise as a successful means to lose weight, the article caused consternation among exercise professionals. Amazingly, we didn’t actually cover this story on the Science of Sport. Well, to be fair, I saw it, but it came right in the middle of the World Athletics Championships, which featured Bolt and Semenya, two of the biggest stories of the year, which I was not about to leave alone to tackle this question. However, it’s certainly on the cards in 2010, because it needs to be addressed. Is Time magazine correct? Or are they just dressing up common sense in the form of sensational reporting to sell magazines? The reality is that the article, for those who read it, contains elements of truth, and could prove invaluable to people who are exercising but NOT losing weight (and there are many). Basically, the key point is what is called “The compensation problem”. It’s hardly rocket science – when you exercise, you tend to compensate by reducing other activities and by eating more food (or the wrong food). The net result is that all your hours of sweat don’t add up to kilograms lost. Is that the same as saying that “exercise is pretty useless for weight loss?”. Not at all, and this is where Time magazine did itself, its readers, and many exercisers, an enormous disservice. It left out a vast body of research which does show that exercise aids in weight loss, and it portrayed limited research suggesting that exercise was ineffective through a very biased lens. It was, to be frank, a poor piece, given ‘credibility’ by the quotes like those above, from leading scientists. We’ll address this in more detail in 2010 – so all of you making new year’s resolutions involving exercise and weight loss, stay tuned! Our number 5 story of 2009 flew well below the radar, even here in South Africa, where in 2008, Pistorius was THE BIG NEWS. Perhaps it was because this story came at around the same time that more reports on Caster Semenya surfaced. Perhaps it’s because people are tired of the Pistorius PR machine. Pistorius had an eventful year off the track – a boating accident which was alleged to have been the result of alcohol, a night in jail after allegations of assault, and finally, a research publication by his own scientists which suggested that he enjoyed an advantage of 10 seconds in a 400m race. The first two stories made headlines here in SA, the third barely registered, though we covered it briefly on the site in November. But it was the outcome of 18 months of research, led by Prof Peter Weyand and Hugh Herr. Somewhere on that 18 month journey, a major split in the camp occurred, because the paper alleging a 10 second advantage was published by Weyand and Matthew Bundle, and was responded to by a rebuttal by Herr and a host of colleagues. The exchange between the two camps got heated, with Herr eventually borrowing quotes from the great sportsman John McEnroe to try to force home his point (“You cannot be serious“). Herr’s arguments also borrowed from video footage recorded off a television screen, which came across as a hastily put together defence that was utterly lacking in scientific credibility. Weyand’s case, on the other hand, revolved around the fact that Pistorius is able to reposition his limbs so quickly, thanks to their reduced mass, and because of the energy characteristics of the blades, which reduced the energy cost of running and allowed increased energy return compared to human limbs. This had already been shown by Bruggemann as far back as October 2007, incidentally. The evidence was deliberately omitted and the CAS decision was made based on deliberately misleading science. Again, the wrong decision has been made. Either way, the point is that this “new evidence” is not new, and has existed for some time. But decisions were made without taking it into account. The legal process has suffocated the science, which, I have to say is what I have written since the CAS verdict was first announced. Pistorius, then, pulled the victory at the CAS because of legal loopholes and the science which should have been presented never was. The process was flawed, and 2010 should see it revisited so that the right decision can be made. To be clear, I think 10 seconds is high. When the story broke, I felt the advantage might be between 5 and 10 seconds. For Weyand to vindicate this position means that intuition, theory and a vast body of data are now aligned and in agreement. Will 2010 see the correct decision made? Marathon running (among men) has never been as healthy as it was in 2009 – records fell with extra-ordinary regularity and 2:07 become a pre-requisite for success. But is marathon running really that healthy? Join us for the Number 3 story of 2009 to start the debate! This post is part of the following threads: News/Controversies, Oscar Pistorius, Year-in-Reviews, 2009 – ongoing stories on this site. View the thread timelines for more context on this post.